Nicolette is pursuing her master’s in Environmental Education at OSU with a focus in free-choice learning. She holds her bachelor’s in Psychology and Applied Behavior Analysis and has worked in the zoo and aquarium field for the last 15 years. 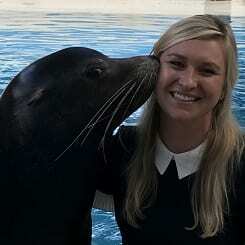 As a result of her experiences conducting wildlife education presentations for visitors and utilizing behavioral principles to train animals, she became interested in understanding the role zoos and aquariums play in pro-environmental behavior change. Her research is focused on how these organizations design, implement, and evaluate programming that targets pro-environmental behavior. Nicolette is excited to have Hilary on her committee and is looking forward to learning all she can from her!